To celebrate the opening of Sunrise Meditation and Counseling in Sautee Georgia, the electronic Kindle version of Christian Tantric Meditation Guide is being offered for free for a limited time through Amazon.com. Kindle ebooks can be easily read on PC’s, Macs, and Android devices using free Kindle Aps which are available through Amazon.com The promotion will be running from May 31st 2015 through June 4th 2015. Our first meditation workshops are being offered on June 13th 2015. Based on the book Christian Tantric Meditation Guide, these workshops will introduce key concepts and introductory practices required for engaging in Christian Tantric Meditation. The skills of Mind Stabilization and Stress Reduction Meditation will be shared in the morning workshop, and the skills of Opening Consciousness and Self Awareness Meditation will be shared in the afternoon workshop. Christian Tantric Meditation is unique in that several practice disciplines are utilized in a series. Each practice builds on the skills introduced in the previous practice. After the introductory practices are learned, more advanced practices are introduced, including Self Emptying, Divine Communion, and advanced Compassion training. While many meditation techniques are primarily focused on the mind, CTM exercises the mind, heart, and core areas of consciousness. This holistic approach to meditation increases mind body self awareness and can be used to address issues such as anxiety, physical pain, and physical cravings. CTM practice can also increase a person’s capacity for love, self esteem, Spirituality, and Compassion, and reduce blocks to success and intimacy. Registration for classes is easy, either sign up on our website or call 678-358-8775 for more information. This entry was posted in Announcement, Book, Meditation, Publication, Uncategorized and tagged Announcement, Book, Meditation, Mindfulness, News, Pain, Spirituality, Wellness on May 30, 2015 by Dave Miller. We are now accepting registrations for Meditation Workshops on Saturday June 13th. We are offering a morning Workshop that covers Mind Stabilization and Stress Reduction practices 10-11:30 AM, and an afternoon workshop that features Opening Consciousness and Self Awareness practices from 1:00-2:30 PM. Visit our Contact and Registration page or call 678-358-8775 for more information. The warm response and interest that Sunrise Meditation and Counseling has received has been very gratifying. This blog is being posted to answer a few questions that have come up about the practice and the location. Why Sautee Georgia? Why not closer to Atlanta? Sautee is a beautiful and peaceful environment conducive to healing and restoration. There is value in engaging in Workshops and therapy some distance from one’s home. Depending on where in the Atlanta Metro area a person is coming from, the drive can take as little as 1 hour and 15 minutes on a weekend. I’ve personally spent more time in traffic during rush hour in Atlanta trying to travel just a few miles. And, our “Visiting Sautee” page gives directions to avoid the tourist backup that can accumulate approaching Helen. I personally engage in Spiritual Direction on a monthly basis, and my Spiritual Director is located on the Southeast side of Atlanta. I find that the drive there provides an opportunity to consider my motivation and needs, and the drive back is an opportunity to reflect on the session experience and how it applies to my life. Why individual Workshops? Why not full weekend retreats? Many people want to “get away” but can’t engage in an entire weekend or even an overnight activity. We offer a weekend “day trip” option. 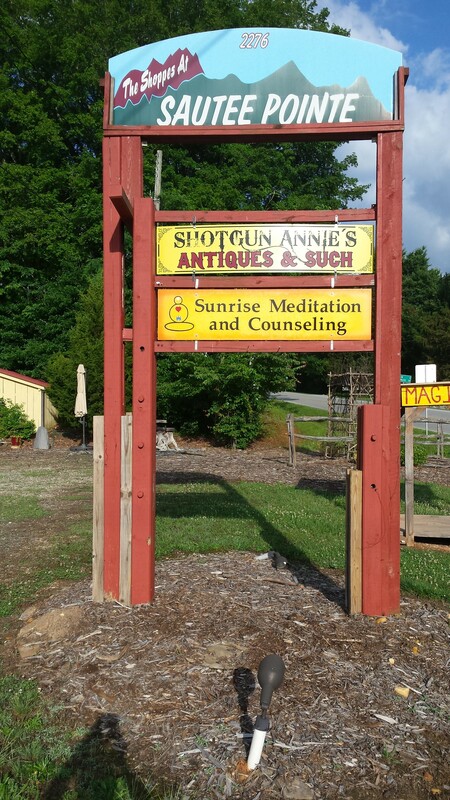 Our “Visiting Sautee” web page offers pointers to local lodging and scenic attractions if a person or couple wants to create their own “retreat weekend” that includes Workshops or Therapy. We also offer a discount on single day back to back workshops so a person can enjoy multiple workshops in a day if they choose. Is there any way to get Christian Tantric Meditation Workshops closer to Atlanta? Meditation or Recovery Workshops can be provided for groups of people at a location of their choosing evenings during the week. Workshops have been provided for groups in private homes, and have been discussed with Church groups. Call us at 678-358-8775 for more information if you are part of a group who has an interest. This entry was posted in Announcement, Meditation, Recovery, Workshop and tagged Announcement, Meditation, News, Recovery, retreat, Spirituality, Therapy, Wellness, workshop on May 27, 2015 by Dave Miller.